Happy Wednesday Lovelies!! We are going to show you 2 Valentine’s day party inspirations today since we were so bust with out own shoot yesterday that we weren’t able to post at all. We want to show you lots of inspiration for our favorite holiday! There are too many seriously lovely details in today’s Valentine’s inspiration. 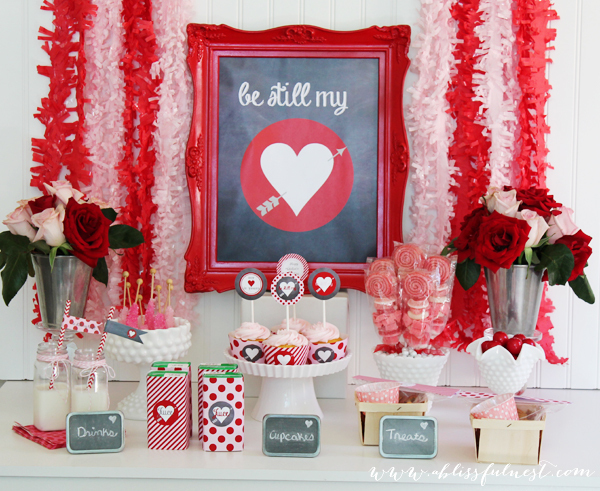 This Be Still My Heart Valentines Day Party is much a beautiful mix of modern and vintage. The chalkboard sign is just fabulous! We love that red frame too. It is the prefect focal point for this dessert bar! The modern stripes and polka dots brings such a fresh and whimsical look too. We love the fringe backdrop in red and pink. It is such a fun and flirty look. Mix that with vintage milk glass as candy holders with some seriously lovely milk bottles and fruit baskets and you get this adorable look that this be still my heart valentines day party just exudes.